TEXAS: Cruz Lead Shrinks To +5 With One Week To Go - Joe.My.God. 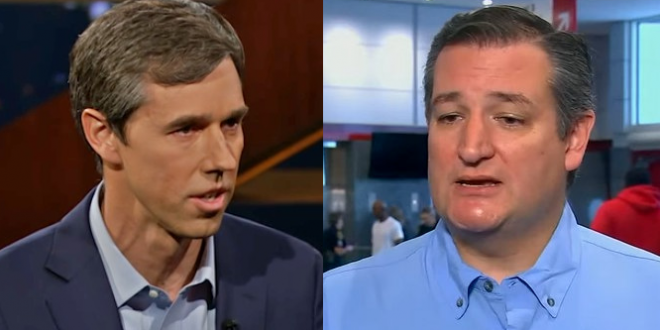 Republican incumbent U.S. Sen. Ted Cruz clings to a narrow 51 – 46 percent likely voter lead over U.S. Rep. Beto O’Rourke, the Democratic challenger in the Texas Senate race, according to a Quinnipiac University Poll released today. This compares to a 54 – 45 percent Cruz likely voter lead in an October 11 survey. Today, O’Rourke leads 56 – 40 percent among independent voters and 96 – 2 percent among Democrats. Republicans back Cruz 96 – 3 percent. Men back the Republican 56 – 39 percent, as women go Democratic 52 – 45 percent. White voters back Cruz 67 – 30 percent. O’Rourke leads 86 – 12 percent among black voters and 60 – 36 percent among Hispanic voters. Only 3 percent of Texas likely voters remain undecided and only 2 percent of likely voters who name a U.S. Senate candidate say they might change their mind in the next eight days.